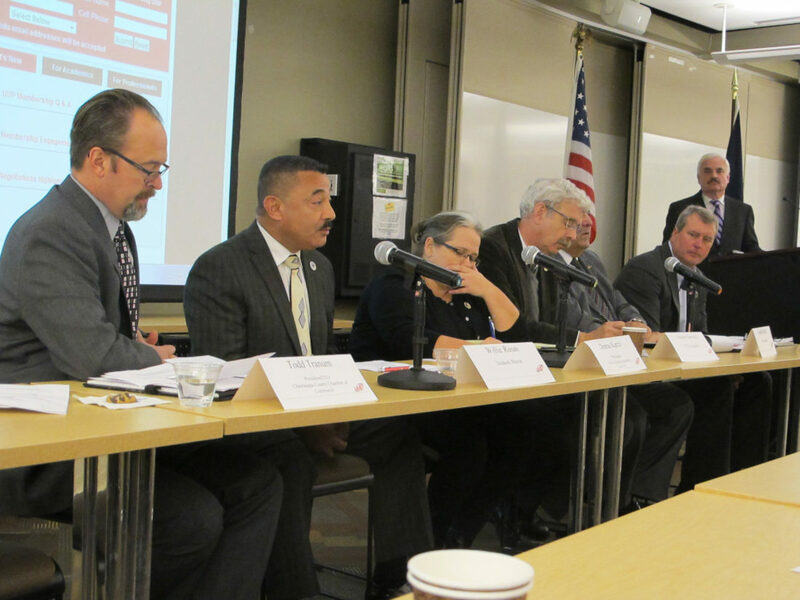 OBSERVER Photo by Mary Heyl Dunkirk Mayor Willie Rosas addressed questions related to jobs and training in Chautauqua County at a recent United University Professions Fredonia Chapter meeting. Pictured, from left, are Todd Tranum, CEO and president, Chautauqua County Chamber of Commerce; Rosas; Donna Karcz, council president, Public Employees Federation Division 243; Assemblyman Andy Goodell, R-Jamestown; Assemblyman Joe Giglio, R-Gowanda; Mark Geise, CEO, County of Chautauqua Industrial Development Agency; and Mike Igoe, SUNY Fredonia professor and panel moderator. Arnavut turned over the panel discussion to moderator Mike Igoe, assistant communications professor at the college. Following each question, Igoe gave each panelist the opportunity to share a brief answer. Panelists included Todd Tranum, CEO and president, Chautauqua County Chamber of Commerce; Dunkirk Mayor Willie Rosas; Donna Karcz, council president, Public Employees Federation Division 243; Assemblyman Andy Goodell, R-Jamestown, District 150; Assemblyman Joe Giglio, R-Gowanda, District 148; and Mark Geise, CEO, County of Chautauqua Industrial Development Agency. The first question Igoe asked was, What skills are currently in the highest demand in our region? Geise responded by referencing County Executive George Borrello’s recent survey, which revealed that both skilled and unskilled jobs need to be filled. Giglio recognized the need for more professionals, such as doctors and nurses, and noted that when the population decreases, these professionals leave, too. Goodell noted a demand in manufacturing based on visits to plants such as Nestle Purina and Cummins, but said finding employees who are “clean, dry and sober” is a challenge. Karcz, too, recognized the challenge posed by the “drug epidemic,” as those who are hired cannot always maintain sobriety. Tranum reported a high need in manufacturing, although the tourism and the hospitality industries are growing, county-wide, too. “We did a survey in 2015 and found that over a five-year period, we would need 280 manufacturing people per year just to fill retirements. That number is increasing every day,” said Tranum. The second question Igoe asked was what panelists felt was needed from educators. Rosas emphasized the need for bilingual people, based on calls he consistently receives from employers and local, county and state-wide agencies. “In the city of Dunkirk school district, it is over 50 percent Hispanic,” he said. “We need to embrace the diversity.” Rosas recalled a school forum he recently attended, where he asked how many students could speak Spanish. He was disappointed to see that even students whom he knew were bilingual were embarrassed to raise their hands. “Embracing that skill — and it is a skill — to know and understand two languages is something that will be important in the future,” Rosas predicted. When asked what things they would ask for — on a “Christmas wish list” of sorts — answers ranged from soft skills to mentoring opportunities. Tranum said fundamental work skills such as punctuality, work ethic and teamwork skills were necessary. Rosas desired more incentives from New York state for young entrepreneurs. Karcz envisioned more mentoring opportunities, such as apprenticeship programs, as a way that both soft and technical skills could be taught in a hands-on setting. Goodell supports employer incentives to encourage area businesses to hire by mitigating the expenses that employers incur in training someone new. Giglio recognized the importance of creating an environment of hope for the next generation, while also helping students set realistic expectations about what a good job is and how to learn the skills to obtain one in this area. Geise noted the importance of schools working closely with the community to find out what skills are needed. He would like to see school officials and teachers visit area business to discover, firsthand, the ways in which students need to be prepared to enter the workforce. In closing, Igoe asked panelists to consider their number one priority for economic development. While all panelists talked about filling jobs, Tranum emphasized the consequences of failing to meet this goal. “Site selectors across the country and world help companies locate and decide where to build a new plant or where to relocate,” he said. “The number one issue is workforce…without people, it doesn’t happen.” According to Tranum, Chautauqua and Cattaraugus counties’ manufacturing shipments per year total $6.5 billion. The eight-county region of western New York generates $26.8 billion annually, $3.6 billion of which is distributed through payroll.